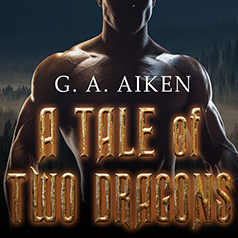 G. A. Aiken presents A Tale of Two Dragons, a prequel novel in the Dragon Kin series. Addolgar the Cheerful wishes he could say he's helping the pretty royal strictly for honorable reasons—but he'd be lying. It's not his fault, though! He didn't tell Braith of the Darkness to have the most delicious tail he's ever seen! Yet before Addolgar can get his very strong claws on that tail, heads are going to roll. Just hopefully not theirs . . .